Lucia Makamure joined Gender Links in 2011 as a Programme Officer.Makamure is a trained journalist with over 10 years experience working on public policy issues. Her career began at the Zimbabwe Independent as a political reporter. Her work on gender, education, climate change and human rights issues has been published in several publications in Southern Africa and internationally by news agencies like Reuters. Lucia is a 2016 Commonwealth Scholar completing a Masters in Public Policy and Management with the University of York. The scholarship is awarded to young leaders from developing countries with the potential to play a leading role in the implementation and tracking of the Sustainable Development Goals. 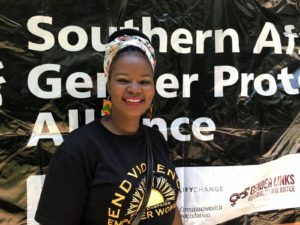 Since 2011, Lucia has written the Education and Training chapter of the SADC Gender Protocol Barometer as well as act as co-editor of the annual research book. Her research work has been cited in respectable literature on education and gender including in the United Nations Education, Scientific and Cultural Organisation (UNESCO)’s Education for All 2000-2015: Achievements and challenges report. Makamure also holds professional Certificates in Political Reporting, Governance and Policy Analysis from the Berlin International Institute of Journalism and Public Policy Analysis, Governance and Leadership from Africa University.